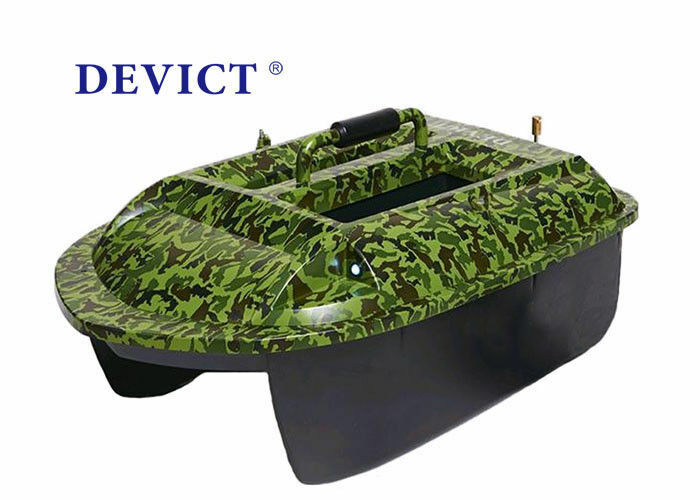 Remote Range bait boat DEVC-318 Camouflage fishing bait boat ABS Engineering plastic boat. 1. The whole ship use high durable ABS, elegant appearance, sturdy and durable. 2. The hatch of the hull and other connected components are installed with sealing rubber ring,Even when it is raining,the cabin will not influent. 3. Standard color is camouflage & other colors could be choose as want in this form. 4. Specially designed propeller protective cove and propeller to prevent weeds. 5. Wild type hull design to resist the impact of large waves, stable navigation. 6. 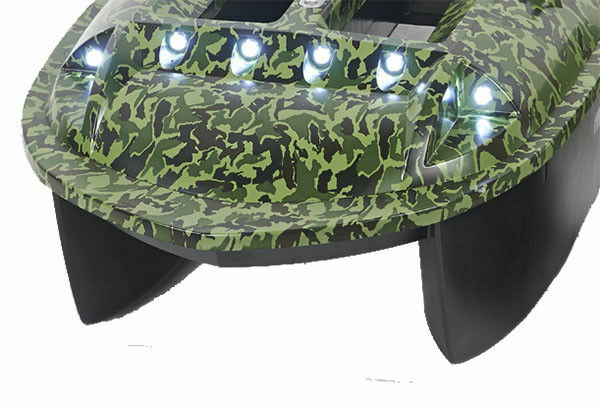 Front and rear two color LED lights can be sailed at night, at a long distance can also identify the fore and aft bow. As all the DEVICT bait boats,it's facility with high level electronic parts and best engineer plastic boat hull to ensure it's high quality in this industry all over the world. Designed scientific structure to make boat in silence sailing,easy maintain and exchange batteries.It could be widely used in the lake,river and calm sea to dropping fishing line and baiting by remote technology. The intellegent battery level indicator ensure warning the boat saling back in time before battery used out. Update technology facility every year to make product perfect. The six white LED lights on the front at the rear help to know the boat direction and the location of the boat in poor light or at night. Once the boat battery volt is lower close to margin, all these LED lights will be flashing as warning. *. The highlight of DEVICT Scata is its facility with super remote control & lithium battery to make it as a luxury fishing tackle. *. The size is a little smaller than DEVICT Catamaran bait boat, but still as catamaran boat keeps wave resistant ability under 5~6 class wave in the water. *. Act as the DEVICT bait boat, the silence sailing, easy maintain and exchange batteries, with high stalility and credible quality, along with the two-years guarantee service which same as international brand product, became the core reason populared by customers. *. The intellegent battery level indicator with new LVF function could warning users in time to ensure saling back the boat before battery used out. *. Update bait boat every year to make product perfect and advanced technology in this industry all the time is the obviously highlight of DEVICT product. *. The two-years guarantee keep it as the international brand product service.